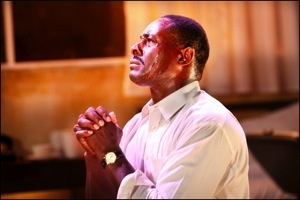 David Harewood in The Mountaintop. Black British actors have often had to go to America for success and good parts, however over the last few months British black actors have burst into the mainstream of London’s theatres and on television playing leading roles and finally getting the recognition they deserve in this country. It has been a good few months for black actors in theatre and on television in Britain. Black actors play the leading role in three of the major theatre productions now showing in London called, Jesus Hopped the A Train at Trafalgar Studios, Ruined at the Almeida in Islington and Eurydice at the Young Vic. Four more productions with an almost all-black cast are due to be shown next month. He will now play the leading role in Welcome to Thebes, opening on June 15 at the National, a different interpretation of the ancient Greek myth of Eurydice played by a predominately black cast. Artistic directors like David Lan aim to produce plays with a racially diverse cast because he believes it reflects the racial make-up of London, however he also said that the West End tends to stick with plays which are commercially safe and largely attracts a white audience. This will now hopefully change after the West End’s Cat on a Hot Tin Roof, played by an all-black cast proved successful. The fact that black actors such as Idris Elba have had to find success in America before they are given a chance to play a leading role on British television or theatre just goes to show how little progress British television and theatre has made in regards to racial representation. Hopefully, the success of black actors in the theatre will begin to influence British audiences and encourage more positive roles and leading roles for black actors on television and in theatre. For now at least the future looks bright for black British actors. This entry was posted in Entertainment and tagged Black British actors, David Harewood, Eurydice, Idris Elba, Jesus Hopped the A Train, Katori Hall, Ruined, The Mountaintop. Bookmark the permalink.